I've got a trip to Reading planned for a few weeks time - anyone got ideas on what routes I should be looking at to do? I've a few in mind already particularly for certain types of vehicles. 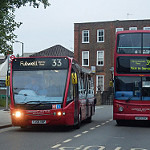 Thames Valley Buses Route 2 withdrawn due to competition. Green Line 702 withdrawn between Legoland and Bracknell outside peak times. New Green Line 703 between Heathrow Terminal 5 and Bracknell. Well I certainly wasn't expecting that! 703 looks like it's designed to be a faster alternative to the 7, assuming it goes Bracknell - Ascot - [old 191 route] - Winkfield - Windsor - Slough - A4 - Heathrow Terminal 5. If 702 only runs to Bracknell in the peaks I wonder if they're reinstating the original fast route via Fernhill roundabout and the A332. I'm not that surprised about the 2 but I was anticipating it might last slightly longer than it has. Maybe those two Scanias will end up on 702/703? Yes it seems like the resources from route 2 will be folded into the new 703, which will still allow Reading Buses to claim two buses an hour between Slough, Windsor and Legoland. Dedworth will be left to Courtney Buses. The new 703 will also allow a more reliable service to operate between Windsor and Bracknell, where it doubles up as the local bus route, as it won't be subject to the vagaries of Central London traffic. Quite a lot of Legoland staff are young people living in Bracknell who don't have their own transport and they will welcome a more reliable link. The area also gets a new direct link to Heathrow Airport into the bargain - currently there isn't one from Bracknell and Ascot and there has not been one for many years. All in all the changes recognise that, apart from the peak commuter flows, the route actually consists of two discrete markets, both of which have potential for growth - leisure travel from London to Windsor Castle and Legoland, and local travel along the Slough - Windsor - Ascot - Bracknell corridor. Is it only me that wonders about the worth of serving T5 instead of, or rather not starting from, Heathrow Central? I have read that North Ascot would only be served by every other 703. If this is the case, where would the other 703 go? I suppose the thinking is that you can transfer to/from the other terminals for free anyway. I haven't looked at the schedule but it could be that running to Central would add too much to the running time. Well yes that is what I have been thinking, especially in regards to the RT. Still, the way I see it is that if you were a passenger at Central and wanted to travel westwards I'd suspect you'd be more likely to wait at Central for a 7 or other bus, than jumping on a train to T5. I would like to be proved wrong however. At the end of the day, any link to Heathrow is better than none! I wonder if there is any spare stand capacity at Central. At a very rough estimate, if the routing is via the A4, then an additional 5mins RT in each direction to get to Central, missing out T5. This would obviously bust if there'd be less than 15mins stand at the Heathrow end. I thought it was to emulate the old 77 between Windsor and Heathrow T5 direct via Slough and the Bath Road, because I know passengers have been calling for that back since it was withdrawn. An educated guess on the 703 routeing would be that they will reinstate the fast run between Legoland and Heatherwood Hospital via Fernhill (as I said for 702 peak runs above). I wonder if it's another time-saving measure, as the 703 route via Ascot is timed to take roughly an hour on Google Maps with the express variant being 5 mins shorter (more in practice of course taking into account traffic and bus stops). There isn't much spare capacity at Central in my experience, possibly just one bus shouldn't make much odds though as 7s tend to go out straightaway with no stand and there's no 441 there any more. Have there been any announcements on this new 703, other than it is happening? Not knowing the area that well I didn't wish to comment on the routeing. The withdrawal of the 702 back to LEGOLAND I feel is sensible, as is the decision to replace this section with a more "local" route. At the end of the day, whether it is T5 or Central, the Heathrow connection will still be a very good link for RB! There hasn't even been the announcement it's happening yet. Terminating at Legoland would merely be a more convenient place to stand as Windsor is notorious for lack of stand space. N&P = Notices & Proceedings (from the Traffic Commissioners). Didn't think to check registrations so I now have and yes 2 is w/d 8th May and 702/702/703 timetable change 8th May. Both were sent in 12th March which is why it corresponded with the 441 as that was done around the same time. So the registrations are there but Reading themselves haven't announced anything to customers. Reading Buses has announced its Good Friday and Easter Monday timetables. Essentially everything operates to a Sunday timetable on both days. Route 2 has an additional earlier journey at 08.00 from Reading to Burghfield Common and 08.26 return, whilst route 17 has a revised and enhanced morning timetable between 06.30 and 10.00 with buses every 20 minutes between 07.00 and 09.00 then up to every 10 minutes. 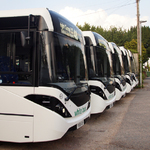 On Good Friday only there are additional evening journeys until around 23.00 on route 1 (Reading-Theale), 2 (Reading-Burghfield Common) and 4 (Reading-Wokingham), whilst route 13 (Reading & Woodley circular) has late night journeys until 02.30 and routes 17 and 21 basically operate to their normal Friday night service. 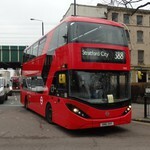 Routes that do not operate on a Sunday do not operate on Good Friday or Easter Monday. Thames Travel X39/X40 (Reading-Oxford) operates to the Saturday timetable on Good Friday, and the Sunday timetable on Easter Monday. Arriva 800 (Reading-High Wycombe) and RailAir to Heathrow Airport operate to Sunday timetables on both days. Routes that do not operate on a Sunday do not operate on Good Friday or Easter Monday.